SPECIALISING in Cantonese cuisine, The Ming Room has come up with a UOB Chef’s Creation lunch set menu that turns out interesting dishes for an enjoyable meal for two. Restaurant master chef Ng Yoon Chai said the meal highlights many of the outlet’s signature dishes, both old and new. 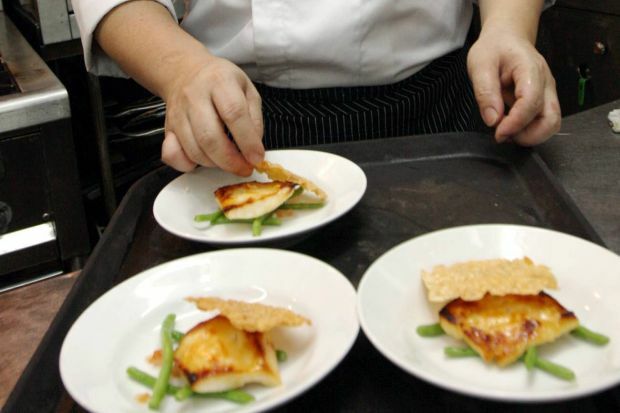 “We try to incorporate something different, whether an ingredient or presentation style, in every dish to keep the meal from being too ordinary,” he said. This time around, the lunch set features a six-course meal that starts off with two dim sums — one fried and one steamed. Next comes the Double-boiled Imperial Teapot Soup where you can pour the soup into a small dish to drink from. “We use the Chinese style of cooking soup but its presentation is Japanese-inspired. The soup has pieces of chicken and mushrooms as well,” Ng said, adding that the dish was one of the restaurant’s specialty. The Baked White Tuna Fish with Miso Sauce has some Japanese influence too. This dish has a sweetness to it without being too cloying and is accompanied by a slice of crunchy tofu skin. 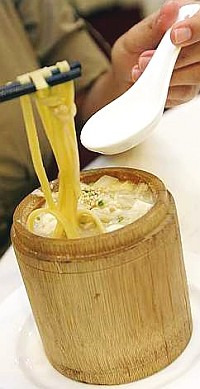 Slurp it up: The Pumpkin Noodles Soup with Crab Meat in Bamboo Cup. A typical Cantonese dish comes next in the form of Braised Ling Zhi Mushroom and Imperial Beancurd with Spinach. The beancurd is smooth, complementing the slightly chewy mushroom — a delicacy in East Asia. Th restaurant’s newest creation; Pumpkin Noodles Soup with Crab Meat in Bamboo Cup was served next. “Initially, I wanted to use ‘sui ching min’ (water steamed noodles) which is a thicker type of glass noodles but it did not complement the broth,” Ng said. After convincing their supplier to make pumpkin noodles for the restaurant, UOB cardmembers will be among the first to enjoy the dish that resembles fettucine in a watery cream sauce. Subtly flavoured, the noodles add an interesting twist to an otherwise simple dish. The meal is completed with a bowl of Lemon Grass Jelly that has a sour bite that goes well with the mildly sweet jelly. The Ming Room also offers a dinner set meal for two consisting of Baked Foie Gras Stuffed with Sea Clams, Double-boiled Coral Shark’s Fin Soup with Wanton in Pumpkin, Pan Fried Cod Fish with Pomelo Sauce, Stir Fried Kai Lan with Preserved Vegetables, Braised Egg Noodle Village Style and Chilled Sweetened Aloe Vera and Longan.